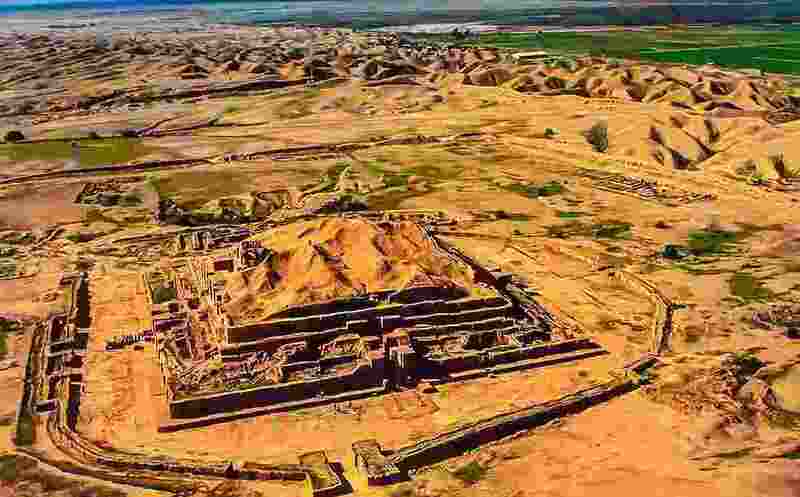 Chogha Zanbil is an ancient Elamite complex in the Khuzestan province of Iran lies 30 Km south-east of Susa and 80km north of Ahvaz. It is one of the few existent ziggurats outside of Mesopotamia. The Elamite name of this structure is Ziggurat to build on a raised area. 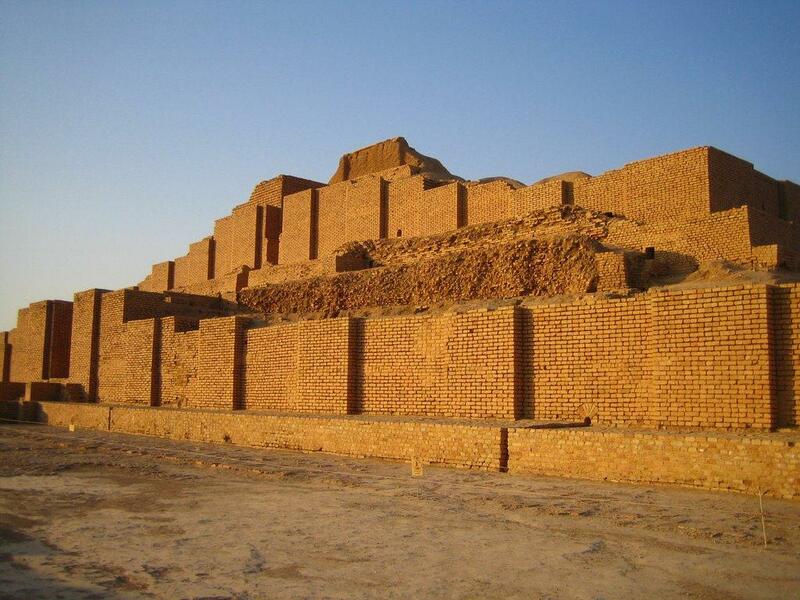 The ziggurat is arguably the most distinct architectural feature of the Mesopotamian civilization. However, some of these structures have been found to exist outside the area once occupied by this ancient civilization. During ancient times, Chogha Zanbil was known as Dur Untaš, and may have been a sacred city of the Elamite Kingdom. 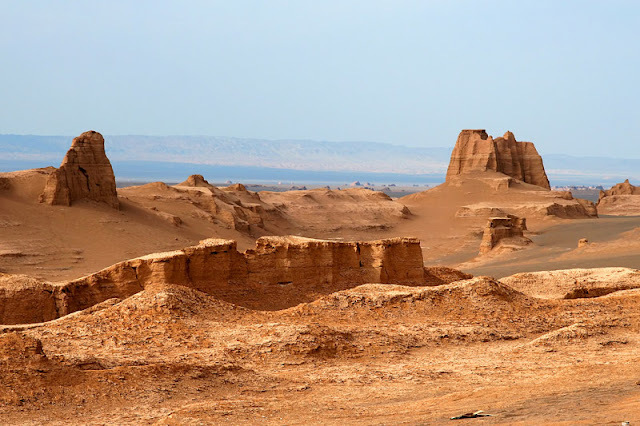 Dur Untash is the combination of Elamite Dur and Untash the Elamite king who build it, however this structure is known by its new Persian name nowadays "Chogha Zanbil" that has given to it Chogha in Bakhtiari means "hill". 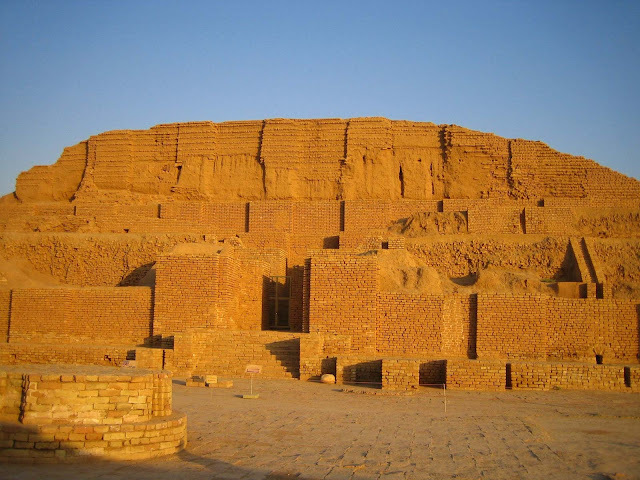 The main building materials in Chogha Zanbil were mud bricks and occasionally baked bricks. The monuments were decorated with glazed baked bricks, gypsum and ornaments of faïence and glass. Moreover, the most important buildings adorned with thousands of baked bricks bearing inscriptions with Elamite cuneiform characters were all inscribed by hand. Glazed terracotta statues such as bulls and winged griffins guarded the entrances to the ziggurat. Choghā Zanbīl, also spelled Tchoghā Zanbīl, or Choga Zambil, affected by heavy rainfalls on the mud-brick outer walls and temples of the complex, despite the application of protective coverings. In the mid-1990s, it was noted that the brick walls of the ziggurat had shifted slightly, raising concerns about future structural damage. Choga Zanbil was built about 1250 BC by the king Untash-Napirisha. The complex is protected by three concentric walls which define the main areas of the 'town'. 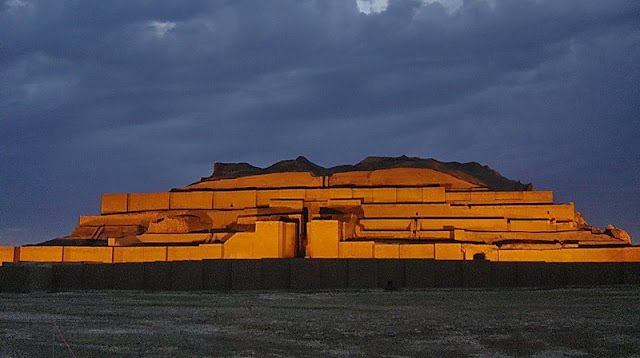 The inner area is exclusively taken up with a great ziggurat which was built over an earlier square temple with storage rooms also built by Untash-Napirisha. However, the middle area holds eleven temples and it was believed that 22 temples were originally planned, but the king died before they could be finished, and his successors discontinued the building work. In the outer area are royal palaces, a funerary palace containing five subterranean royal tombs. 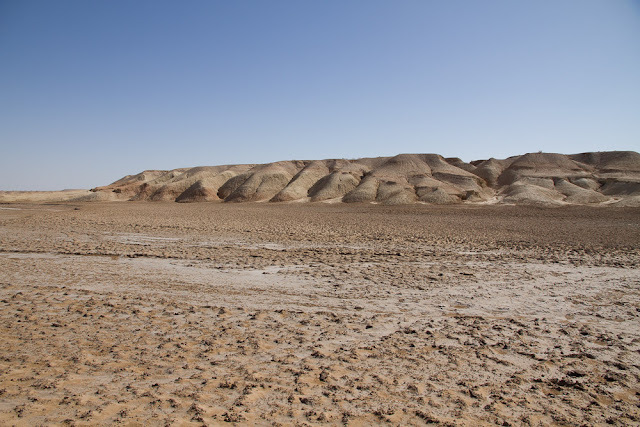 Although construction in the city abruptly ended after Untash-Napirisha's death, the site was not abandoned, but continued to be occupied until it was destroyed by the Assyrian king Ashurbanipal in 640 BC. 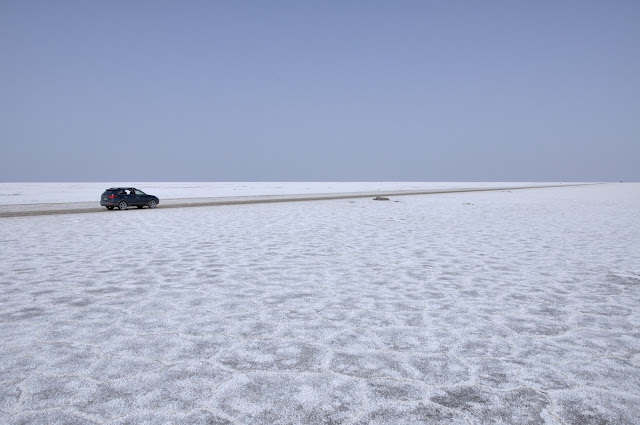 The Dasht-e Kavir, is one of two deserts dominating the region's landscape, is a mix of sand and salt as blinding in its whiteness as it is deafening in its silence. 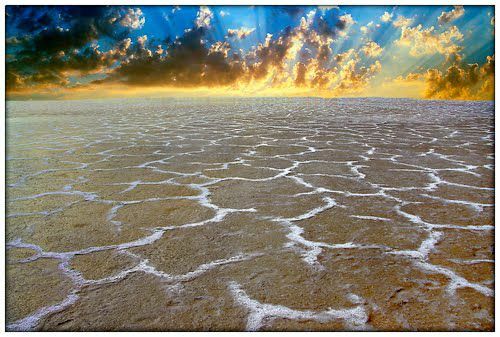 Dasht-e Kavir, is also known as “Kavir-e Namak” and “Great Salt Desert”, is a large desert lying in the middle of the Iranian plateau, around 300 kilometers east-southeast of Tehran. 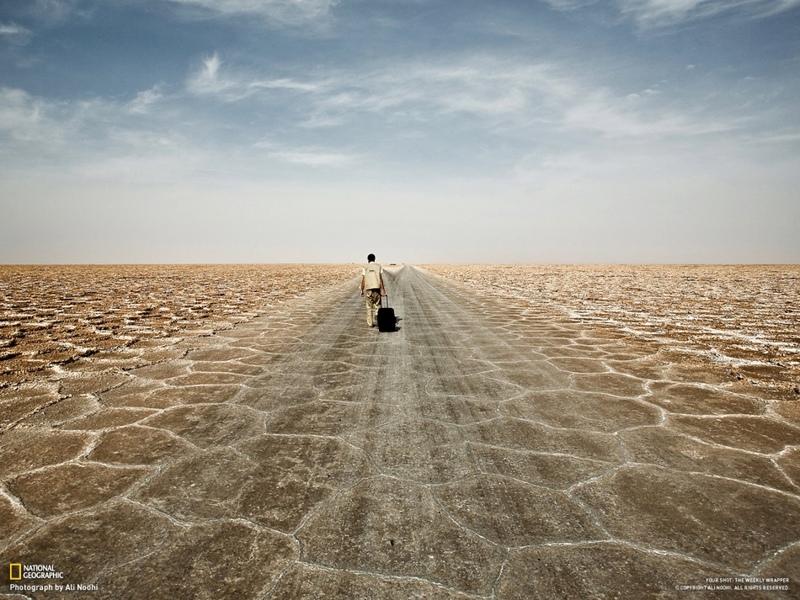 Dasht-e-Kavir desert is approximately 800 kilometers long and 320 kilometers wide, and composed of mud and salt marshes. 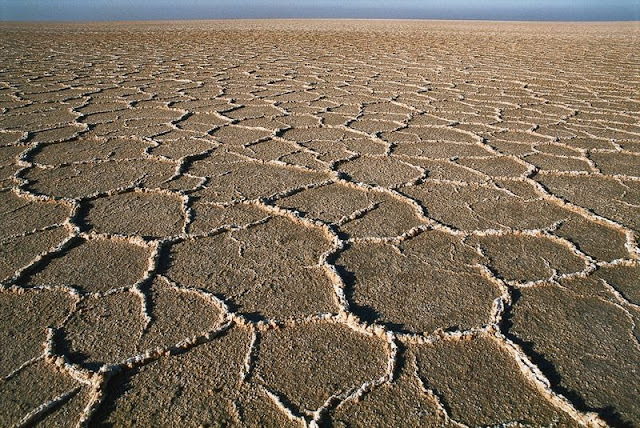 Millions of years ago, this region was occupied by a salt-rich ocean that covers a small piece of continent in what is now central Iran. 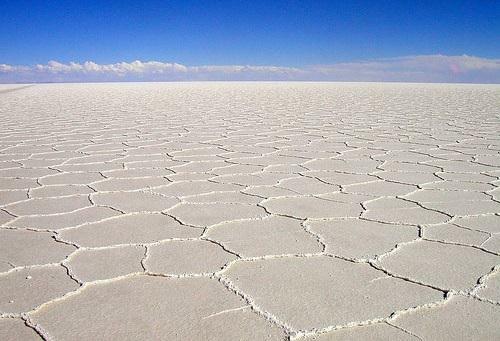 As the time passes, the ocean gets dried up, it left behind a layer of salt as much as 6 to 7 kilometers thick. 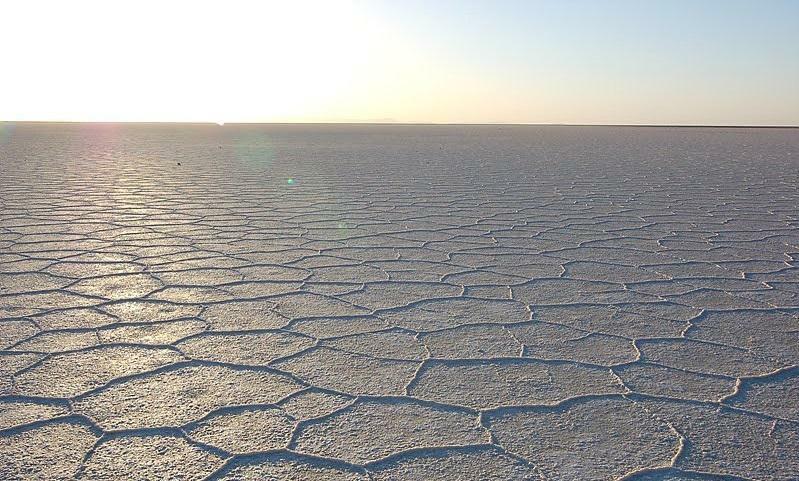 Namak Lake also called Salt Lake is located about 100 km east of the City of Qom in Iran at an elevation of 2,590 feet above sea level. The Namak Lake has a dry surface only water covers out of about 1800 km² area. 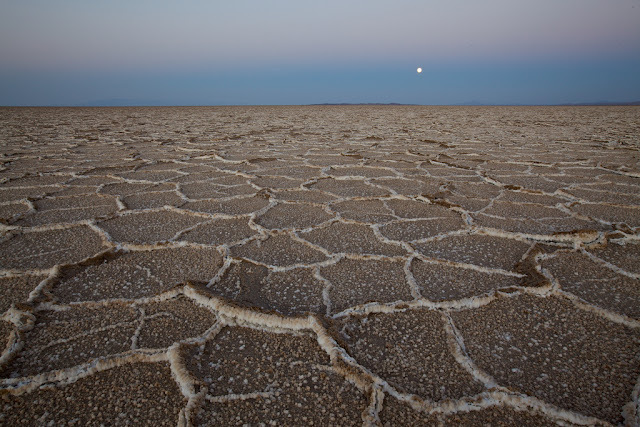 The lake depth is only between 45 centimeters to 1 meter and major source of water supply is river Qom. The Namak Lake is actually a remainder of the Paratethys Sea, which underway to dry from the Pleistocene epoch, leaving Lake Urmia and the Caspian Sea and other bodies of water. 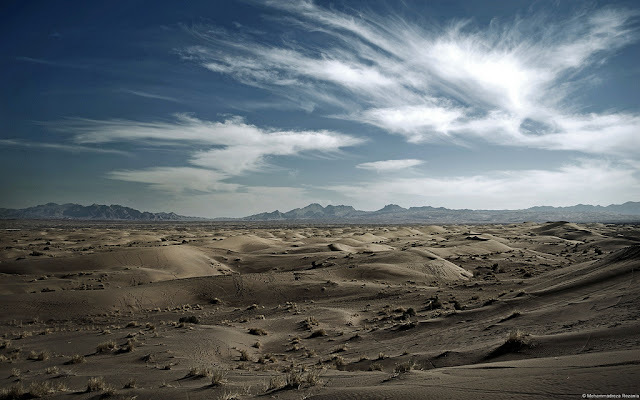 The climate condition is semi-arid and arid, and more moderate in nearby mountains. Therefore, the mean annual temperature is 13.5 ºC, with mean minima averaging -6 ºC and mean maxima averaging 35 ºC. 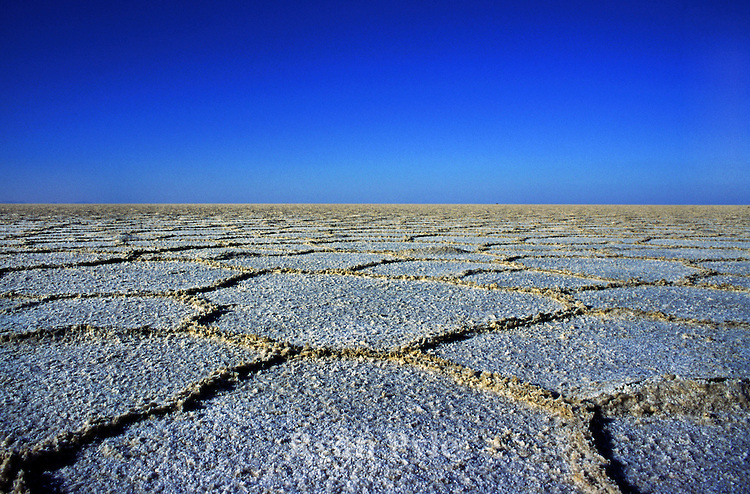 Moreover Namak Lake holds 240 million metric tons of minerals and it is believed, that Iran’s Namak Lake contains rich lithium deposit, extracting 40 grams of lithium per ton is considered as economically justified worldwide. 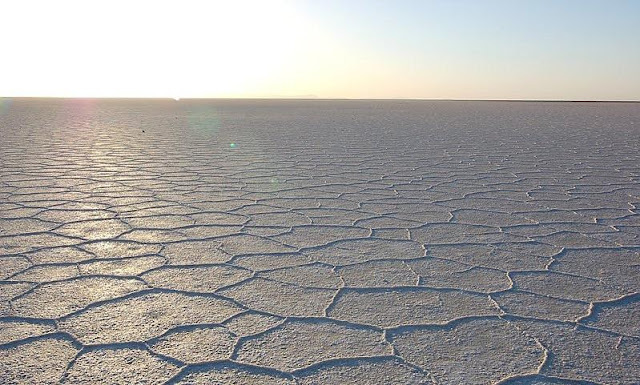 Moreover, massive volume of sodium sulfate deposit, 144 million tons has discovered in the lake. 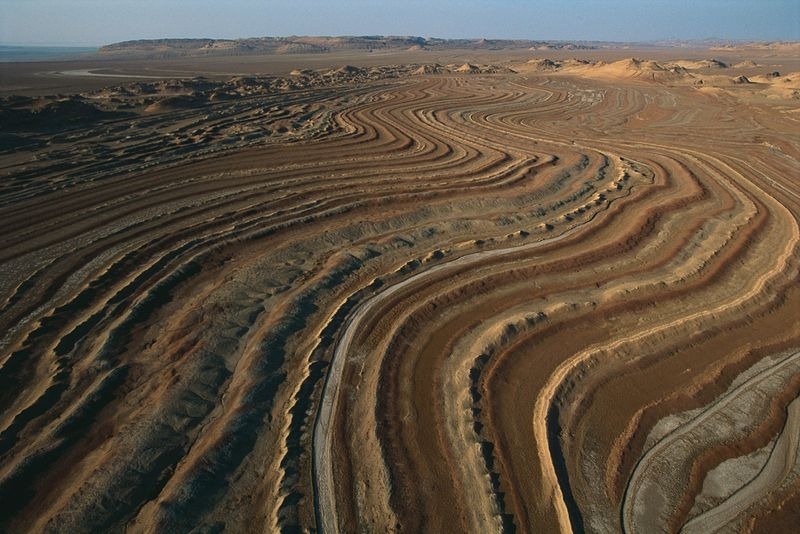 Therefore, three minerals, namely Magnesia, Halite, and Sylvite have been identified so far in the lake, with estimated reserves of 32 million tons, 200 million tons, and 4.5 million tons, respectively these minerals are used in the agriculture, steel, and aluminum industries. Namak Lake is accessible by sandy road and bit far from civilization and city. 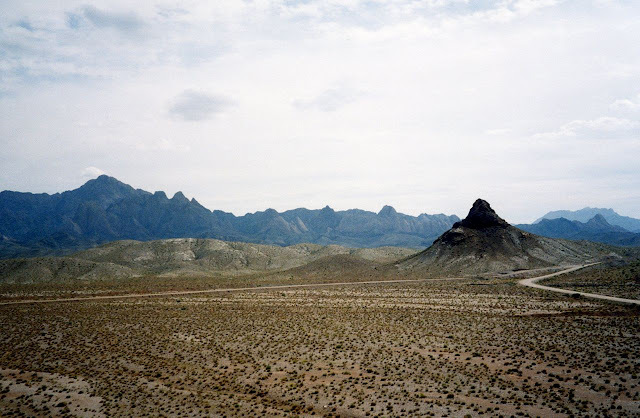 This place is specific for its minimal light smog and it is grotesque to watch stars here and even perspective photographs or skateboarding on silk salty surface is possible. The surrounding area of Lake is semi desert mainly rock with sand. Moreover vegetation cover is sparse, and foothills and wide valleys are characterized by forest steppe. Hence, higher areas well covered with snow in winter along with some permanent ice fields and alpine vegetation. The main fishes comprise of three families Balitoridae, Cyprinidae, and Salmonidae. Thus, native populations of trout (Salmo trutta) occur in the basin and some basins and other water bodies have been stocked with exotics, or exotic species have been acquainting with fortuitously. This ecoregion contains a high degree of endemism in a species-poor endorheic basin. 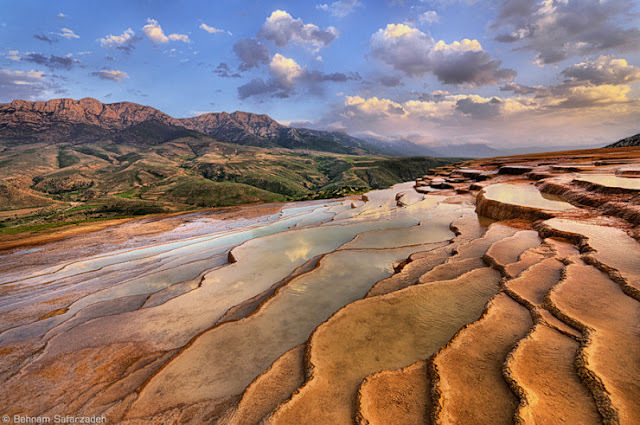 Badab-e Surt (translated gassed water) is located in Mazandaran Province in northern Iran, is considered one of the most incredible sights of its region approximately 95 KM’s south of the city of Sari and 7 KM’s west of Orost village. 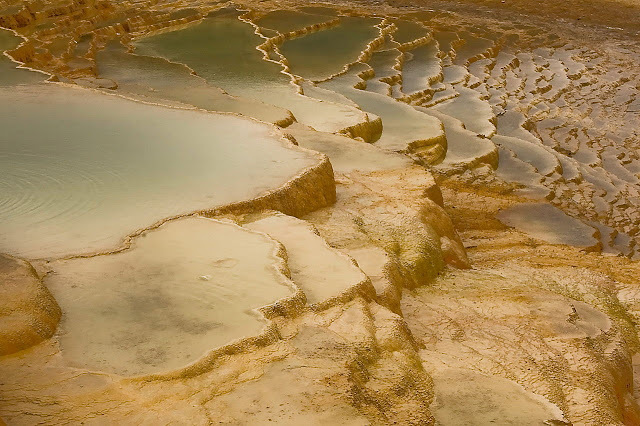 Badab-e-Surt comprises a range of stepped travertine terrace & rock formations that have been generated more than thousands of years as flowing water from two mineral hot springs cooled and deposited carbonate minerals on the mountainside. 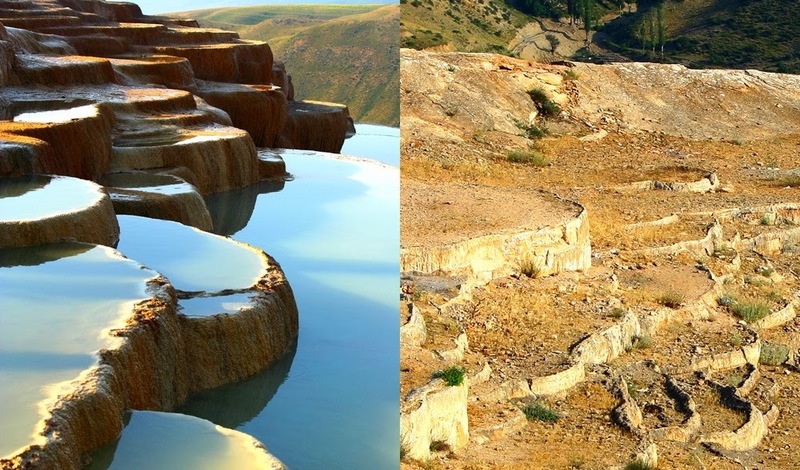 The red color of travertine terraces are due to iron carbonate minerals dissolved in water flowing from mineral hot springs. 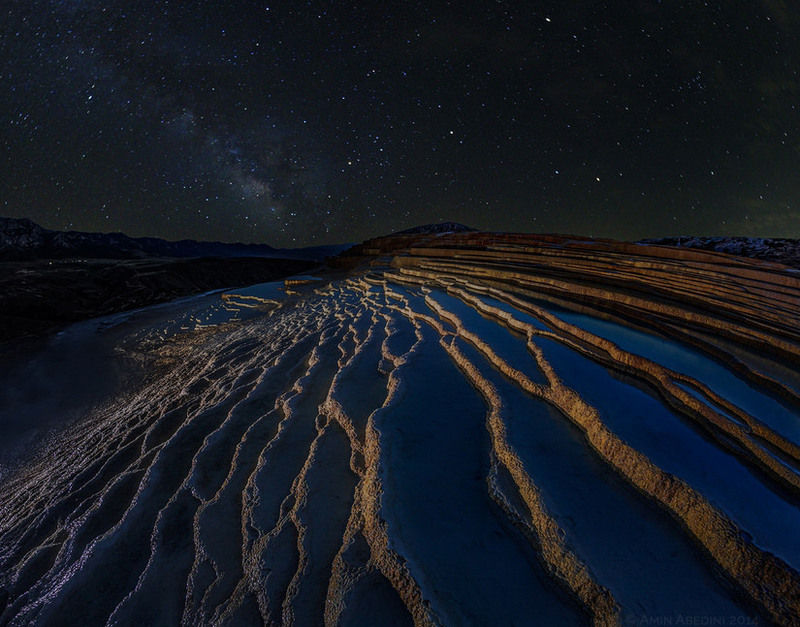 It is thought that the spring pool was created during the Paleocene Era and at the same time as the latest folds in the Alborz mountain range. 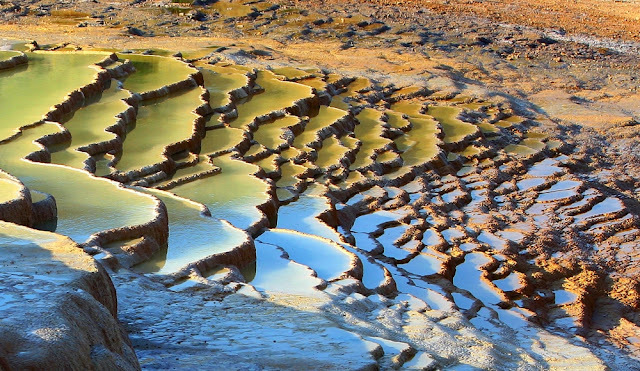 Badab-e-Surt terraces are natural wonder made with two distinct mineral springs with different natural characteristics. Badab-e-Surt is located 1,840 meters above sea level just west of the village or Orost. 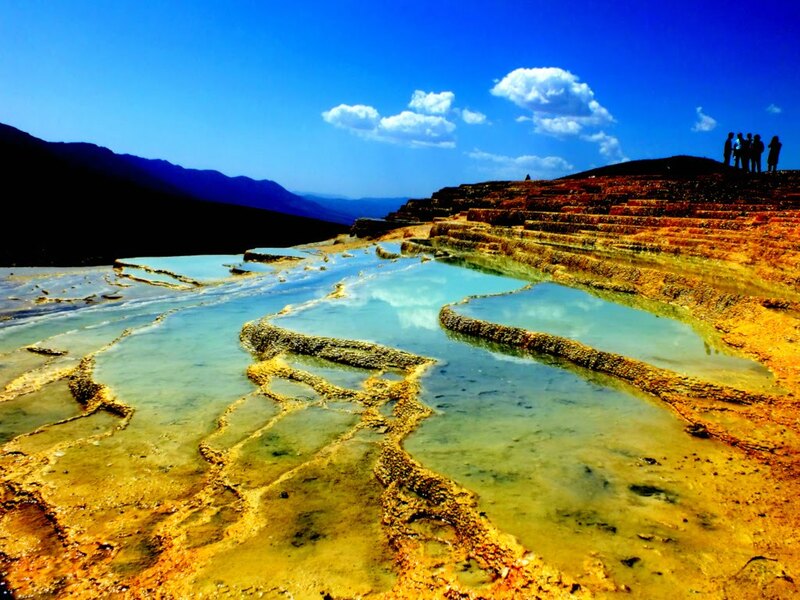 The first spring contains very salty water that gathers in a small natural pool; its water is considered to have medicinal properties, especially as a cure for rheumatism and some types of skin diseases and skin conditions. 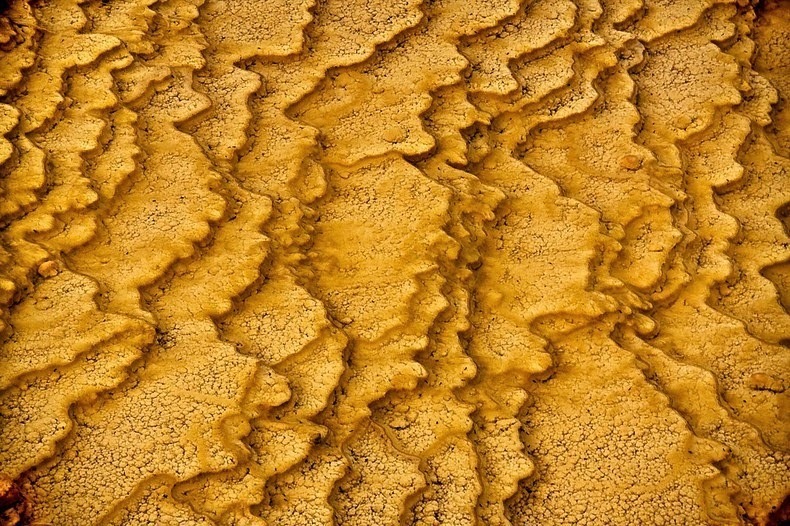 The second spring has a sour taste and is predominately orange mainly due to the large iron oxide sediments at its outlet. In one part of a floor of the pond, there is a deep hole is called the Bermuda Erost. 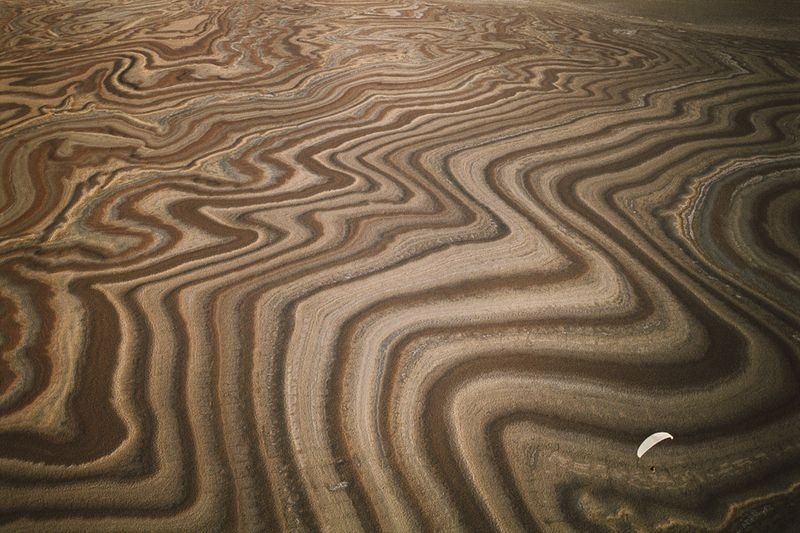 Moreover, stepped travertine terraces are so popular on planet earth. Such famous examples includes Mammoth Hot Springs in Yellowstone National Park, The White Water Terraces and Huanglong Scenic in China, Italy’s Bagni San Filippo, Mexico’s Hierve el Agua and most famous of them all Pamukkale in Turkey. 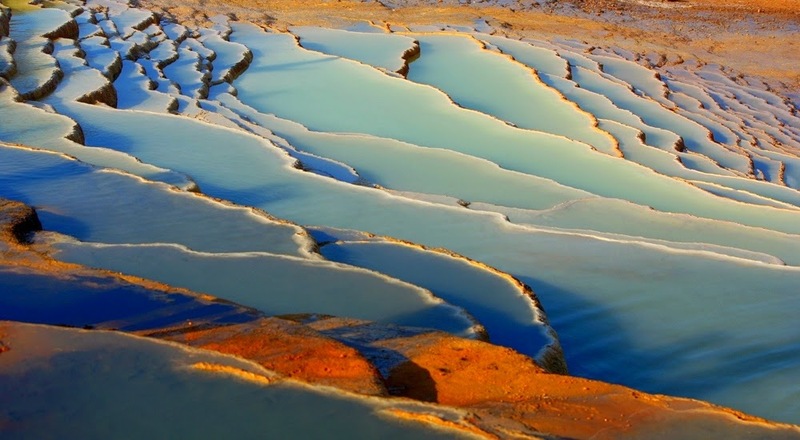 The travertine terraces of Badab-e-Surt are bright orange, yellow and red as compare to others shades of white and blue, due to large amount of iron oxide sediments. Therefore, the water from two springs emanating from the mountain range have combined and resulted pools shaped as a naturally formed staircase. However, the surrounding vegetation to the north contains of pine forests while to the east it mainly comprises of short trees and shrubs; and rock quarries can be seen to the west of the site. Indeed, Badab-e-Surt is fantastic place to see, widespread due to usage of water treatment for many disease. 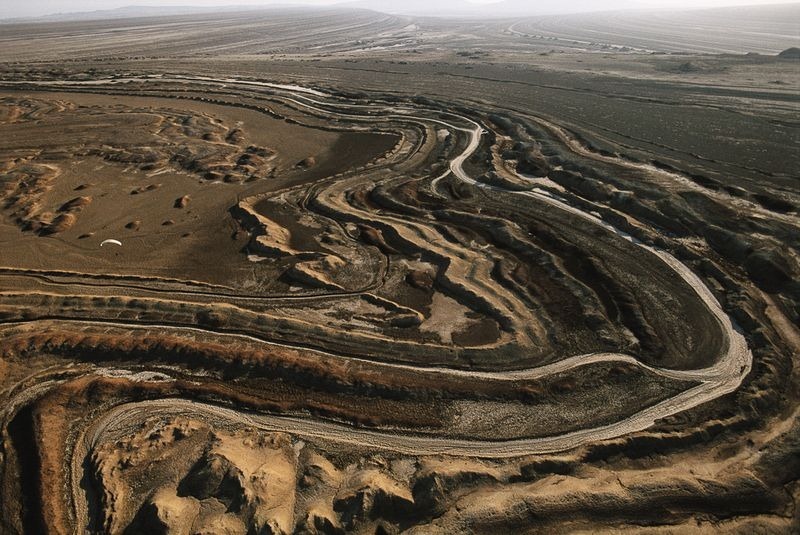 The site has been registered as 2nd natural heritage of Iran in UNESCO’s list. Therefore, the Orost village and Badab-e-Surt Spring are easily accessible via Semnan as most of way is being paved and vehicles are leaving dirt in the air leading up to the spring. It is suggested to visit the place during either sunrise or sunset when the sun’s light offers the orange reflection blends in perfectly colored spring. Although Badab-e-Surt is beautiful in all seasons, But the best time to visit is early April. The Badab-e-Surt is in danger of gradul erosion and eventual demise same like other natural landmarks in Iran however, the environmentalists and nature lovers have repeatedly expressed concern regarding protection of this natural wonder, citing that despite being registered as a natural site. So, it’s a must visit destination for all natural lovers. 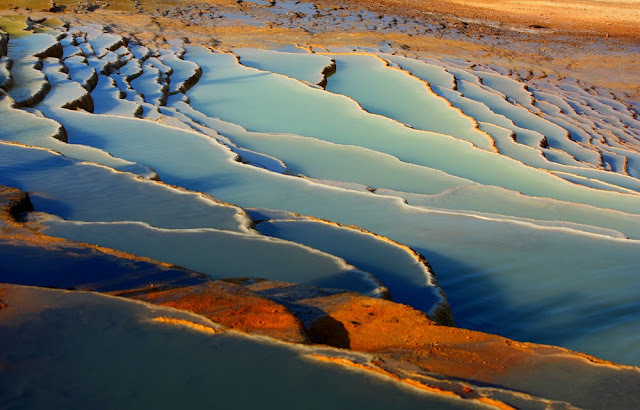 There’s a natural wonder in Iran, called Badab-e Surt situated in Mazandaran Province in northern Iran, 95 KM south of the city of Sari. The Iranian site comprises of wide range of stepped terraces made of travertine, a sedimentary rock shaped more than thousands of years by deposition of carbonate minerals dissolved in water flowing from mineral hot springs. The beautiful Badab-e Surt's terraces are made happed due to two distinctive mineral springs with dissimilar natural characteristics, situated at 1,840 meters above sea level. 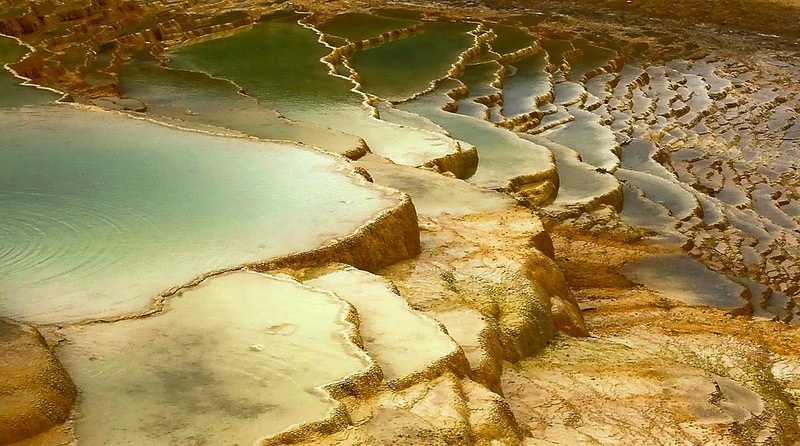 Badab-e-Surt is considered one of the most incredible sights in this region that attracts millions of Iranian and international tourists to its eye-catching nature scenery and fine weather. 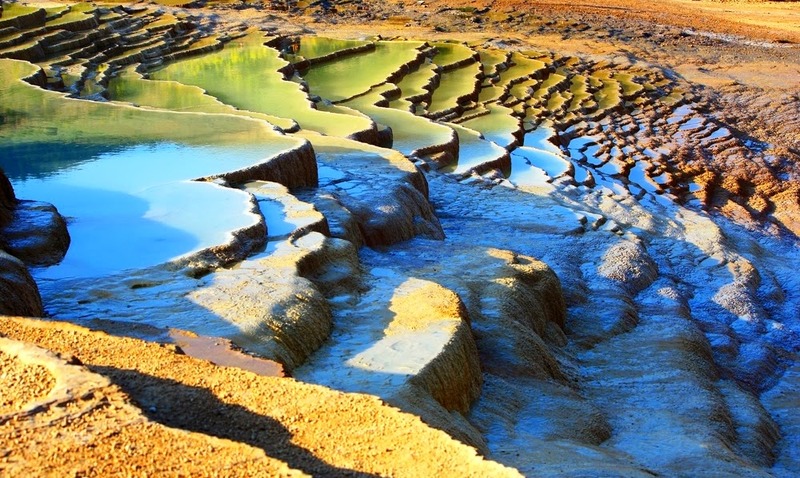 Therefore; the first spring encompasses very salty water that gathers in a small natural pool, which water is believed to have medicinal properties, particularly as a cure for rheumatism and certain types of skin diseases and skin conditions. The 2nd spring has a sour taste and is predominately orange. Stepped travertine terraces are present on numerous places on earth. 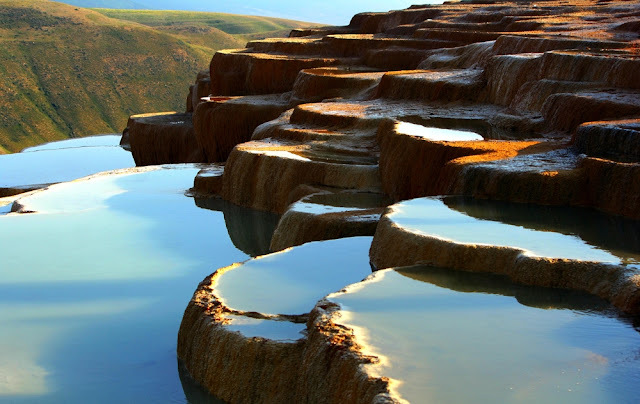 But the other examples include the Mammoth Hot Springs in Yellowstone National Park, the White Water Terraces and Huanglong Scenic and Historic Interest Area both in China, US & New Zealand, but the most renowned of them all is “Pamukkale in Turkey which is tourism hub”. 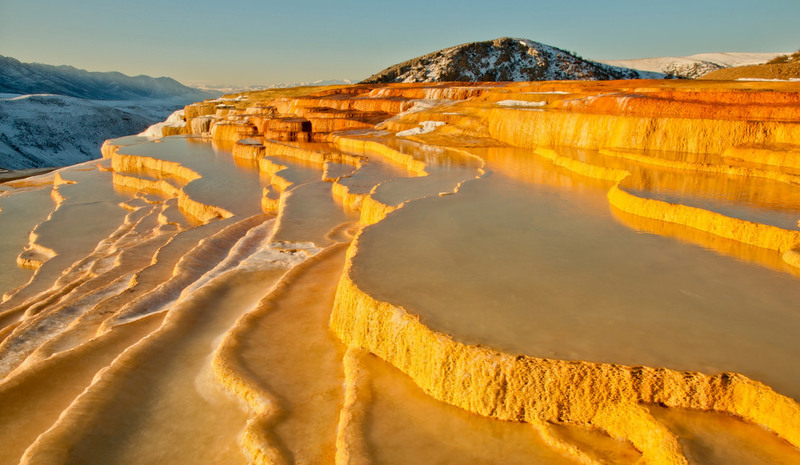 Nevertheless, different the aforementioned hot spring terraces, which are mostly shades of whites and blues, the travertine terraces of Badab-e Surt are bright orange and red. 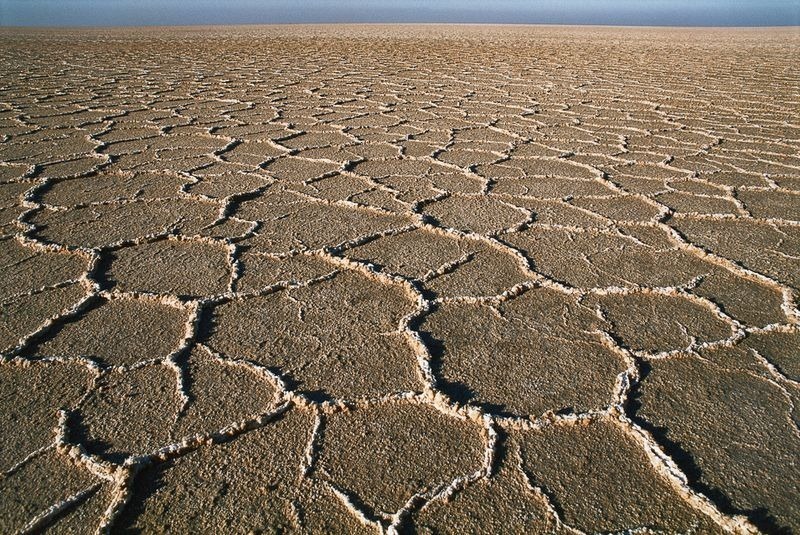 This is due to the presence of large amounts of iron oxide sediments. The Orost village and Badab-e-Surt Spring are easily accessible via Semnan with paved way and vehicles being capable of utilizing the dirt roads leading up to the spring. The best time to visit this place is during either sunrise or sunset when the sun’s orange reflection blends in perfectly with the colored spring. 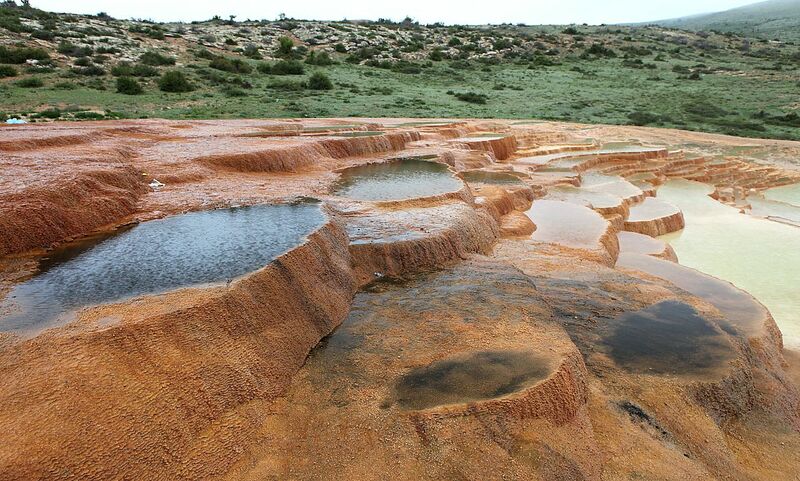 The Badab Soort Spring has been registered as a national heritage site. 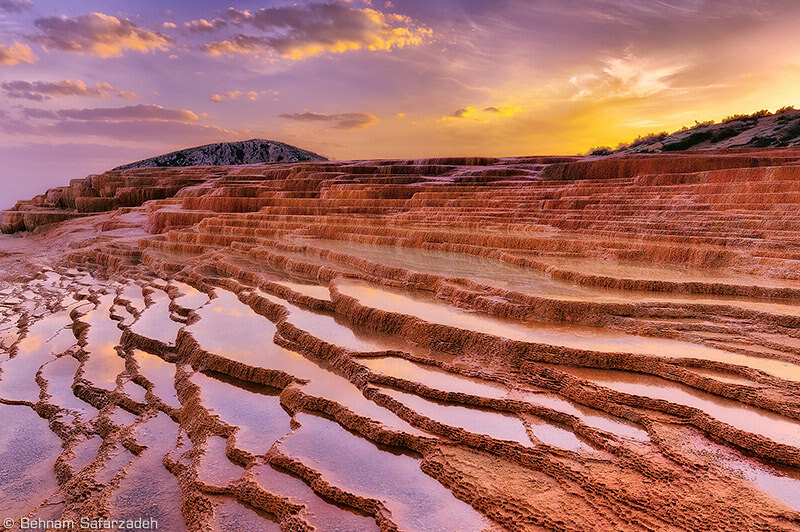 Due to its natural and artificial landmarks in Iran, the Badab-e-Surt Spring was in danger of continuing erosion and eventual demise. But many thanks to the efforts of Lavasan’s Hiking Committee, and Nader Zarrabian, who’re working and has been done their job in order to restore the natural atmosphere of the Spring. 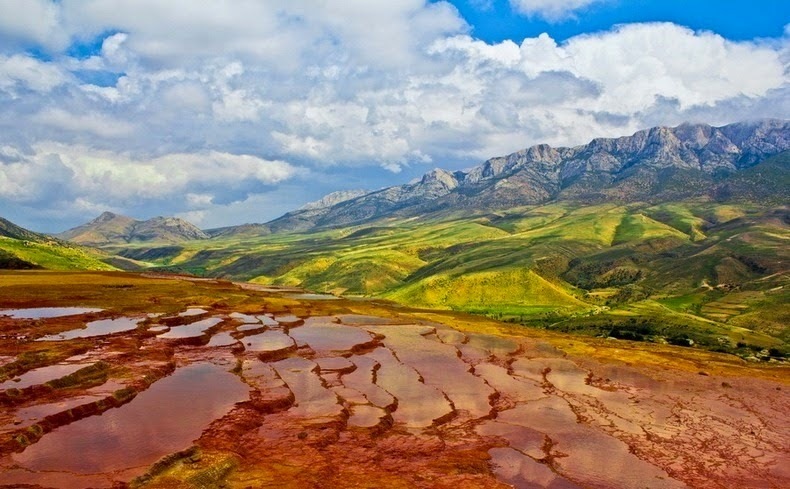 However; countless people visit Mazandaran to shed their exhaustion of city life relaxing on the beaches of the Caspian Sea or staying in the jungle cottages, off the track sites such as Badab–e-Surt springs can also create a lovely memory in the minds of nature lovers who visit northern Iran. 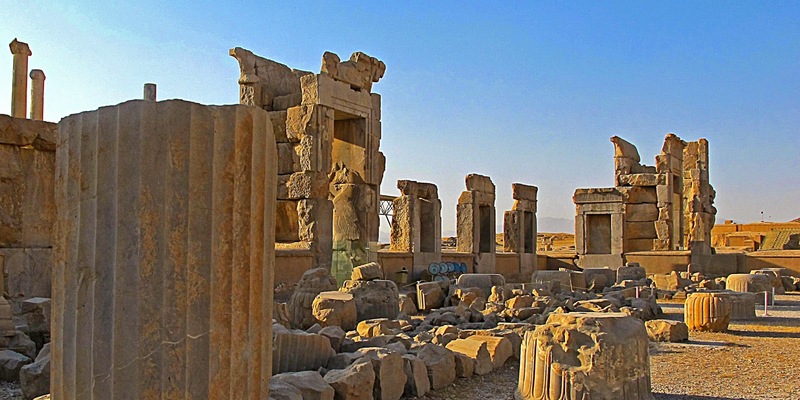 Persepolis is the Greek name for the ancient city of Parsa, located 70 miles northeast of Shiraz in present-day Iran. 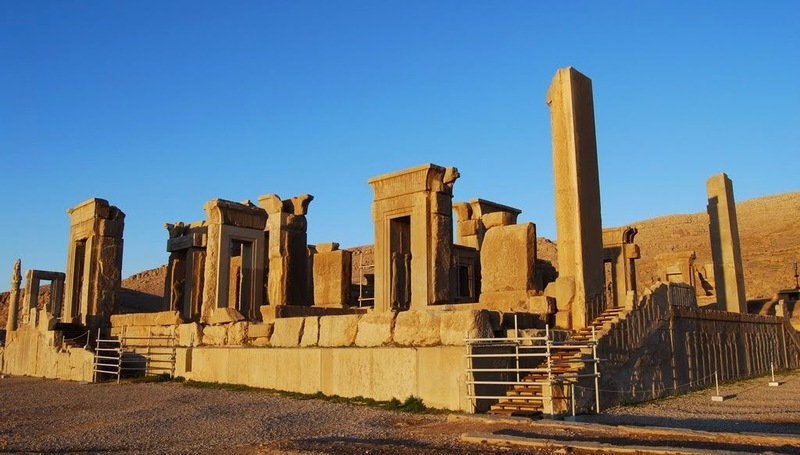 The name Parsa meant “City of The Persians” and the magnificent palace complex at Persepolis was founded by King Darius which construction started at the site in 518 BCE. 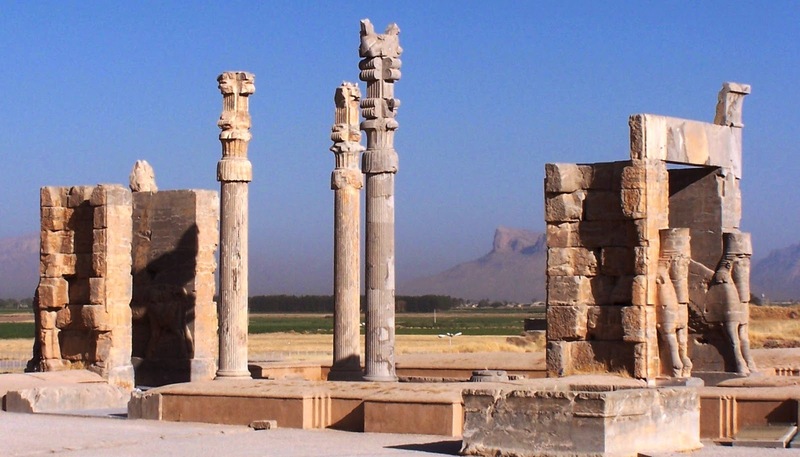 Darius made Parsa the new capital of the Persian Empire, in its place of Pasargadae, the old capital and burial place of King Cyrus the Great. Persepolis visualizing was a majestic show place and the seat of his vast Achaemenian Empire, arrogantly proclaimed his achievement Due to its remote location in the mountains, nevertheless, travel to Parsa is arduous task during the rainy season of the Persian winter when paths turned to mud and the city was used mostly in the spring and summer warmer seasons. The great city of Persepolis was built in terraces up from the river Pulwar to rise on a larger terrace of over 125,000 square feet, partly cut out of the Mountain Kuh-e-Rahmet ("the Mountain of Mercy") in the plain of Marv Dasht about 850 kilometers south of the present capital city of Tehran and about 50 kilometers north of Shiraz. To create the level terrace, huge depressions were filled with soil and heavy rocks which were then secured together with metal clips; upon this ground the first palace at Persepolis gradually grew. 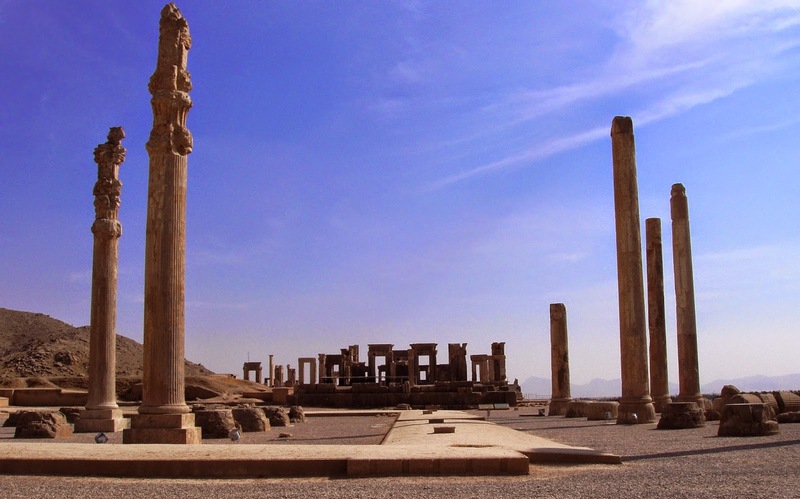 The magnificence of Persepolis lasted only two centuries, though, due to short-lived; but its royal audience halls and residential palaces perished in flames when Alexander the Great conquered and looted Persepolis in 330 B.C. and, carried away its treasures on 20,000 mules and 5,000 camels (According to Plutarch). 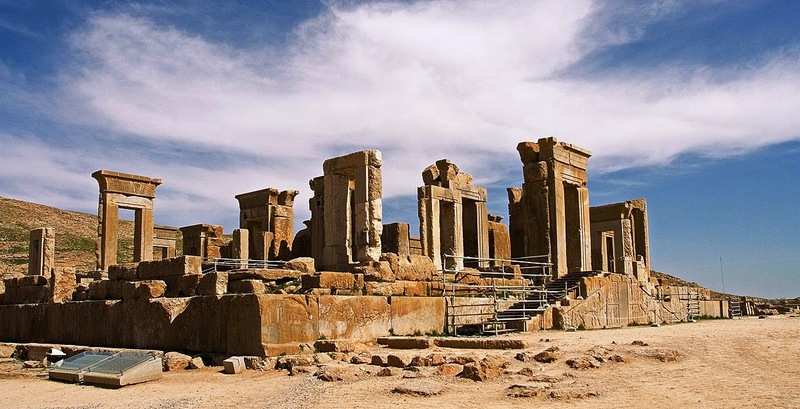 The site was identified in A.D 1620, and following several centuries countless people traveled to Persepolis and ruins of its Achaemenid palaces. Persepolis Palace Complex, Structures, Reliefs, and Inscriptions mainly deal with the architecture of the palace complex, and its buildings and embellishing reliefs. 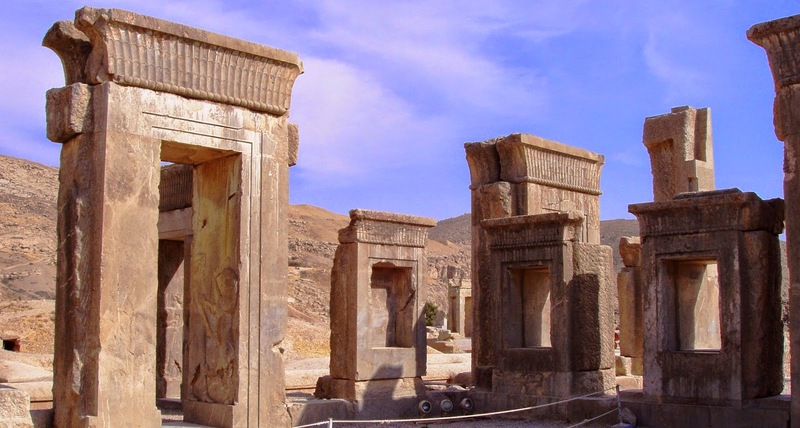 An inscription carved on the southern face of the Terrace proves that King Darius was the founder of Persepolis and its work was began about 518 B.C., though the marvelous task was not completed until about 100 years later by Artaxerxes I. Before any of the buildings could be erected, considerable work had to be done. This mainly involved cutting into an irregular and rocky mountainside in order to shape and raise the large platform and to fill the gaps and depressions with rubble. King Darius planned impressive complex of palaces not only as the seat of government but also, and primarily, as a show place and a spectacular center for the receptions and festivals of the Achaemenian kings and their empire. King Darius lived long enough to glimpse only a small part of his plans executed. His brilliant and lavish ideas were taken up and followed by his son and successor Xerxes, who said: "When my father Darius went the throne, I became king on my father's throne. After I became king what had been done by my father, that I also (did), and other works I added." 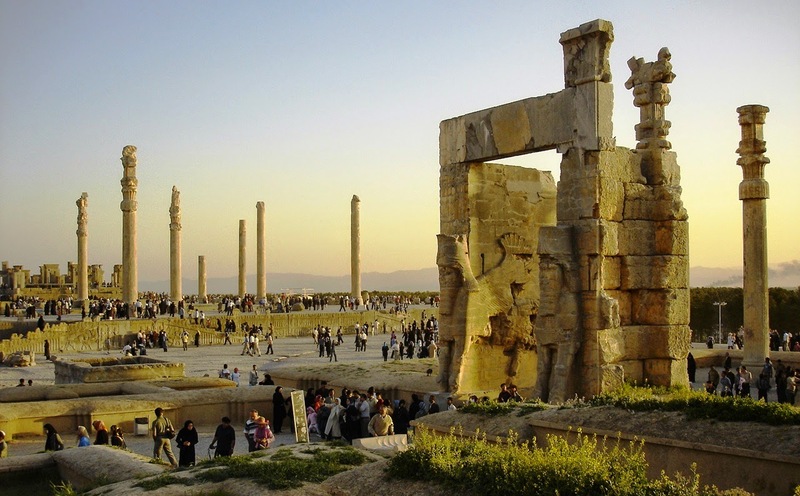 Actually, the Persepolis is mostly the work of Xerxes, according to an excavated foundation inscription. 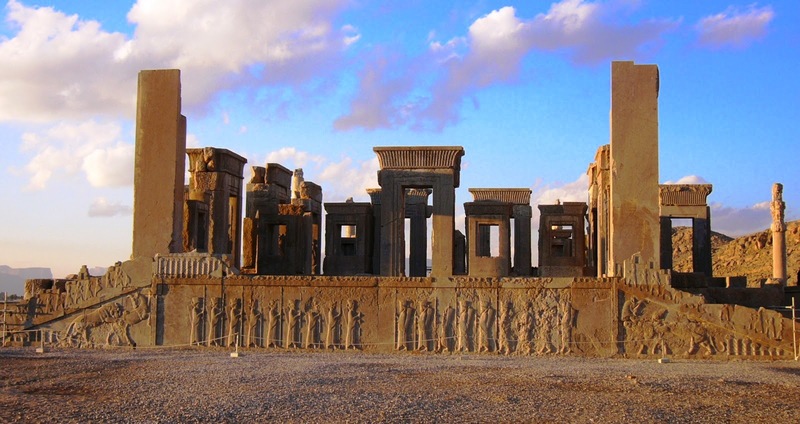 Persepolis platform on the northern part of the Terrace, consisting mainly of the Audience Hall of the Apadana, the Throne Hall, and the Gate of Xerxes, represented the official section of the Persepolis complex, accessible to a restricted public. The other part held the Palaces of Darius and Xerxes, the Harem, the Council Hall, and such. The Apadana is the largest and most magnificent building started by Darius and finished by Xerxes that was mainly used for great receptions by the kings. Thirteen of its seventy-two columns still stand on the enormous platform to which two monumental stairways, on the north and on the east, give access. They’re decorated with rows of gorgeously executed reliefs showing scenes from the New Year's festival and processions of representatives of twenty-three subject nations of the Achaemenid Empire, with court notables and Persians and Medes, followed by soldiers and guards, their horses, and royal chariots. Delegates in their native attire, some completely Persian in style, normally carry gifts as token of their loyalty and as honor to the king. These gifts include silver and gold vessels and vases, jewelry, weapons, woven fabrics, and animals from the delegates own countries. Although the overall arrangement of scenes gives the impression repetitive, there are marked differences in the designs of garments, headdresses, hair styles, and beards that offer each delegation its own distinctive character and make its origin distinctive. Another means by which the design achieves diversity is by separating various groups or activities with stylized trees or by using these trees alone to form ornamental bands. There’s also an intentional usage of patterns and rhythms that, by repeating figures and groups, conveys a magnificent ornamental impression. 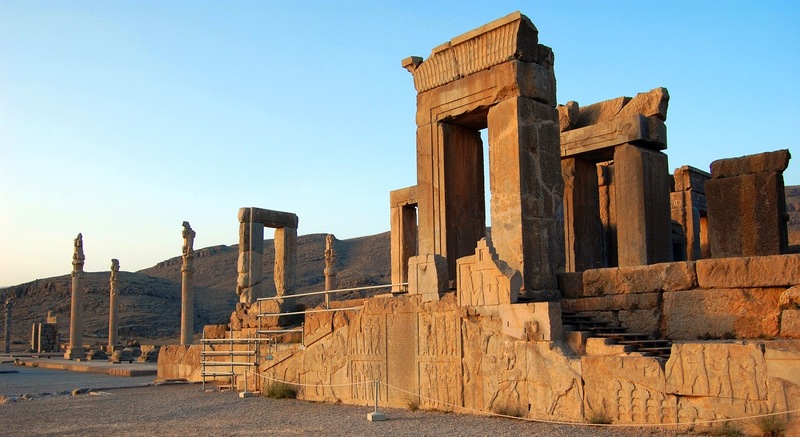 Next to the Apadana, There’s a Throne Hall the 2nd largest building of the Persepolis Terrace. The Throne Hall "Hundred-Column Hall", which was begun by Xerxes and finished by his son Artaxerxes I. Its eight stone doorways are decorated on the south and north with reliefs of throne scenes and on the east and west with scenes depicting the king in combat with monsters. Moreover; the northern portico of the building is bordered by two colossal stone bulls. The beginning of Xerxes' reign the “Throne Hall” was used primarily for receptions for representatives of all the subject nations of the empire. Later on, when the Treasury proved to be too small, the Throne Hall also served as a storehouse and, above all, as a place to display more adequately objects, both tribute and booty, from the royal treasury. Concerning this, Schmidt wrote of the striking parallel in a modern example of a combined throne hall and palace museum where the Shah of Iran stores and exhibits the royal treasures in rooms and galleries adjoining his throne hall in the Gulistan Palace at Teheran. Adjacent to the Throne Hall is the Treasury, part of which served as an armory and especially as a royal storehouse of the Achaemenian kings. The tremendous wealth stored here came from the booty of conquered nations and from the annual tribute sent by the inhabitants of the empire to the king on the occasion of the New Year's feast. Before the Throne Hall was finished, the most spacious room of the Treasury was used as a Court of Reception. Hence; two large stone relieves were discovered here that attested to its function. These depict Darius I, seated on his throne, being approached by a high dignitary whose hand is raised to his mouth in a sign of respectful greeting. Behind the king stands Crown Prince Xerxes, followed by court officials. The Palace of Darius actually twelve columns supported the roof of the central hall from which three small stairways descend. Relieves on these stairways depict servants coming up the steps carrying animals and food in covered dishes to be served at the king's tables. On the eastern and western doorjambs are relieves showing the king in formal dress leaving the palace, followed by two attendants; relieves on the northern and southern doorways depict the king in battle with monsters. The Palace of Xerxes is almost double as large as that of Darius, shows much related decorative features on its stone doorframes and windows, excluding two large Xerxes inscriptions on the eastern and western doorways. In its place of showing the king's combat with monsters, these doorways represent servants with ibexes. Unluckily, all relieves in this palace are far less well preserved than those of the Palace of Darius. The Council Hall is the royal apartment is a pompous stairway which led to three entrances. And two were for official purposes; and the third was a secret doorway which led into the Harem.